The gens Servilia was an Alban family, transfered to Rome, after the desctruction of Alba, by king Tullus, and elected into the patrician order, according to Livy and Dionysius of Halicarnassus. 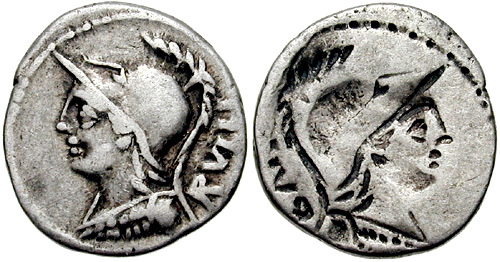 It became divided into many branches, none of whose names, however, are recorded on coins expect Ahala, Caepio, Casca and Rullus. The two last were plebeian. 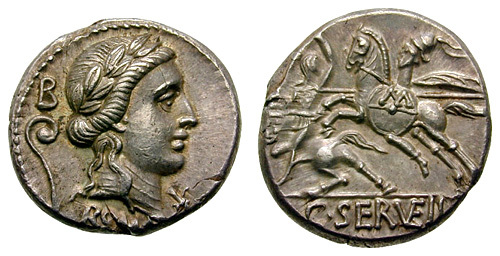 Reverse: C.SERVEIL below two horseman galloping left, one looking back weilding a sword & being speared by the other who holds a round shield inscribed with an M.